Posted in Advice from Spiritual Friends, Mandala. At the 2009 CPMT meeting in France, Nick asked Rinpoche about veganism, to which Rinpoche gives an expansive and motivational response. Nick Ribush: Rinpoche, how do you feel about FPMT promoting a policy of not only vegetarianism, but also veganism, because of the cruelty to animals inherent in the production of dairy products and so forth? 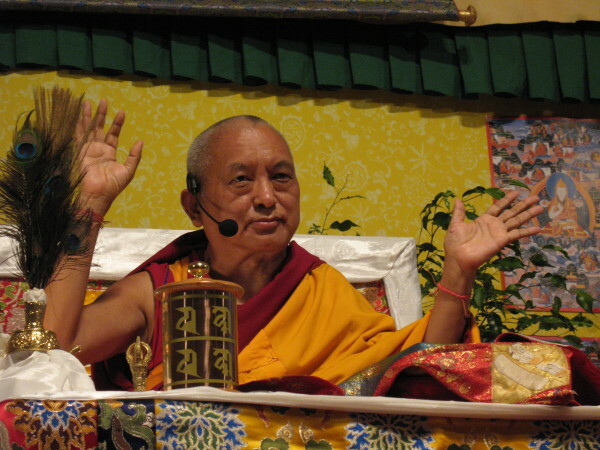 Lama Zopa Rinpoche: The reality is that we cannot live without harming others. There’s no way we can survive without others being harmed, killed. We can’t survive for even a day without causing suffering to others. This is how life is in samsara and that’s why the ultimate answer is to get out of samsara, to be liberated from it. Only when you free yourself from samsara by actualizing the remedy, the true path, the wisdom directly perceiving emptiness, which directly terminates the delusions, the disturbing thought obscurations, and the negative imprints, the seeds of delusion, will you no longer have to reincarnate, no longer have to go through the cycle of death and rebirth, experiencing all the sufferings of the six realms, one after the other.